How do Epidemiologic Studies Contribute to the Identification of Teratogenic Exposures? Epidemiology is the study of the distributions of, and risk factors for, diseases in human populations. Epidemiologists use a variety of designs and statistical procedures to identify and assess risk factors. Epidemiologists who study birth defects are specifically interested if a particular exposure is teratogenic. 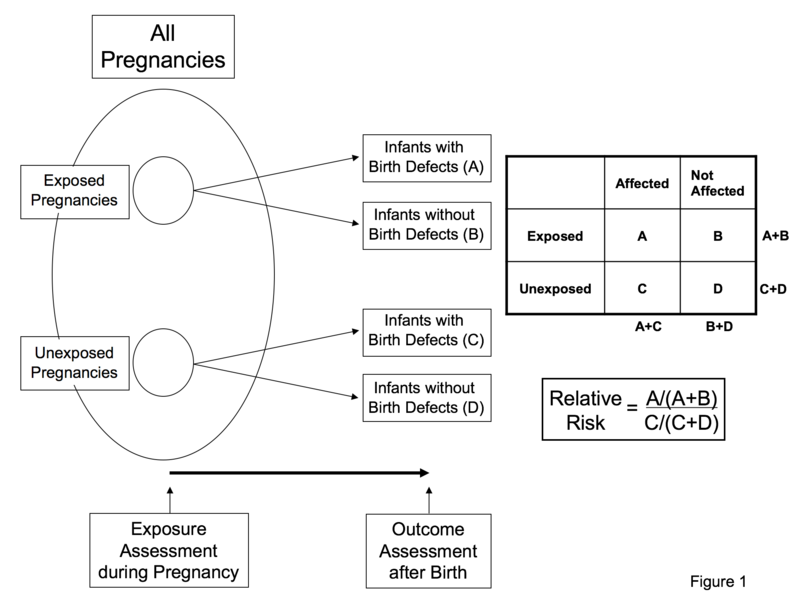 Although clinical observations from a single case or case series sometimes play a role in understanding the effects of a particular exposure during pregnancy, in most circumstances, it is difficult to know whether the observed outcome is due to the pregnancy exposure or if the exposure is incidental. However, these clinical observations may raise clues that can be addressed in epidemiologic studies. Unless a particular exposure (procedure) is thought to be beneficial, most clinical studies cannot ethically be experimental in their design, e.g., randomized controlled trials. Therefore, epidemiologists typically conduct observational studies on populations. In experimental studies, the investigator has much more “control” over the many exposures study subjects may encounter, whereas in observational studies, the investigator is relegated to being an “observer” of the exposures of subjects in a study population. In some instances, these exposures are not known or cannot be adequately controlled. Thus, observational epidemiology studies offer associations and do not establish causation. The two primary types of observational studies that epidemiologists have at their disposal are cohort and case-control studies. The cohort study approach starts with one group of individuals in a defined population exposed to a particular agent and compares the risk of disease/outcome in that group to a second group of individuals from the population not exposed to the same agent (Figure 1). Cohort studies may include the entire population of interest or at least a large segment of the population and often require long periods of follow-up time to reliably measure the risk of disease/outcome between the two groups. The second main type of observational study design – the case-control – includes all cases of the disease of interest in the defined population, but only a sample of the non-diseased population (Figure 2). The epidemiologist determines the ratio of cases to controls that are included in the study, and compares the frequency of the exposure/factor of interest between cases (with the disease of interest) and controls (those without the disease of interest). These types of studies tend to be more economical than cohort studies, because one does not have to enroll as many individuals as would be needed in a cohort study, many of whom will never get the disease/outcome that is of interest for the study. This is particularly important when the study outcome is infrequent. Figure 1. Study design of a cohort study: Pregnancies (exposed and unexposed to the agent of interest) are identified from all pregnancies in a defined population. Birth outcomes (whether the baby has a birth defect or not) are determined. The proportion of infants with birth defects among exposed pregnancies is then divided by the proportion of infants with birth defects among unexposed pregnancies to determine the relative risk. Adapted from Fletcher et al., 2005. Associations in these observational studies are assessed by calculating “risk estimates” for the exposed group relative to the unexposed group. The typical measure used in cohort studies to estimate how large an association is between a factor of interest and a disease/outcome of interest is known as the relative risk – see Figure 1. A relative risk of 1.0 indicates that the risk of disease in the group exposed to the factor is the same as the risk of disease in the group not exposed. Relative risks more than 1.0 indicate that risks are higher in the exposed group, whereas relative risks less than 1.0 indicate that risks are lower in the exposed group when compared to the unexposed. The typical measure used in case-control studies to estimate how large an association is between an exposure or factor of interest and a disease/outcome of interest is known as the odds ratio - see Figure 2. The odds ratio is an approximation of the relative risk when the outcome is rare, and its interpretation is similar to the relative risk. That is, an odds ratio of 1.0 indicates no association between factor and disease, an odds ratio >1.0 indicates an increased risk association, and an odds ratio <1.0 indicates a decreased risk association. Confidence intervals are a measure of statistical precision of the relative risk or the odds ratio. Confidence intervals that contain 1.0 indicate that relative risk or odds ratio estimates do no not differ statistically from the no-effect value of 1.0. Ascertainment - Some birth defects are much more easily ascertained, e.g., severe heart defects, such as hypoplastic left heart syndrome, are more likely to be ascertained than less severe heart defects, such as ventricular septal defects and atrial septal defects. These less severe defects are much more difficult to ascertain uniformly in a population because they may be asymptomatic in early life. Ascertainment of a defect needs to be nearly complete: if there is variability within a study in how well defects are ascertained between exposed and unexposed individuals, the observed result may be spurious. Grouping of defects - Human birth defects comprise many different developmental systems and structures, reflecting manifold differences in underlying pathogenesis and etiologies. It is believed that most teratogenic exposures do not tend to increase risks of all birth defects. Many investigators have pointed out that even specific groups of defects, e.g., heart defects, are heterogeneous in anatomy, development, and epidemiologic factors. Combining different birth defect types for analyses is a valid approach only if the defects being lumped have an underlying pathogenesis that is similar. Control groups - A very important consideration in case-control studies is the selection of the control group. An appropriate control group in a study of a specific birth defect is a random sample of mothers/babies who would have been included in the case group if their child had the birth defect being studied. In the circumstance with a medication taken during pregnancy that is indicated for a limited set of underlying conditions (e.g., a particular antidepressant medication), a further approach might be to choose a control group that had the underlying condition but did not use the medication. The latter may not be practical nor may it be ideal because those with the underlying condition may differ in severity of the condition. Confounding - Studies investigating whether a specific birth defect is associated with a particular exposure need to accurately assess whether other factors associated with the exposure contribute to the results, such as maternal age. For a factor to be a confounder, it must be associated with both the exposure and the outcome. If these other factors are known and have been measured, they can be addressed analytically with statistical methods such as logistic regression. Chance - As noted above, the confidence interval provides a guide to determining the likelihood that a result occurred by chance. Another way to determine such likelihood is by using p values. The p value is an estimate that the differences observed occurred by chance alone, assuming that there is no difference between exposed and unexposed women. Typically, p values of < 0.05 are considered statistically significant, meaning that if the study was repeated many times the true effect estimate would be within the confidence limit 95% of the time. Bias - In addition to chance, it is important to consider whether some sort of study bias is an alternative explanation of the results that have been observed. Bias can be introduced in a variety of ways, e.g., mother’s recall of an exposure, incomplete case ascertainment, and confounding (description above). If bias is present, it will cause observed results to differ from the truth. Observational studies need to be particularly aware of such biases because the “treatment” or exposure under study was not assigned randomly. Statistical methods sometimes, but not always, can be used to address some biases. One factor to consider in case-control studies is whether the results observed could be due to recall bias, the tendency for a woman who had a baby with a birth defect to be more likely to recall prenatal exposures than a woman who had a baby without a birth defect. Absolute Risk vs. Relative Risk - Another issue to consider is what the study results mean for an individual woman with a particular exposure. It is important to recognize that an elevated relative risk or odds ratio needs to be put into context by taking into account the frequency at which the outcome occurs in the general population. A relative risk of 3 means that an exposed woman is at a three-fold increased risk of the particular outcome. If the outcome is rare (1 in 100,000), her absolute risk if exposed to the medication is 3 in 100,000 (1 in 33,333), whereas if the outcome is more common (1 in 100), her absolute risk would be 3 in 100, or 3%. Carey JC, Martinez L, Balken E, et al. 2009. Determination of human teratogenicity by the astute clinician method: review of illustrative agents and a proposal of guidelines. Birth Defects Res A Clin Mol Teratol 85:63-68. Christianson A, Howson CP, Modell, B. March of Dimes Global Report on Birth Defects. 2006. Feldkamp ML, Carey JC, Byrne JLB, Krikov S, Botto LD. Etiology and clinical presentation of birth defects: population based study. BMJ 2017;30;357:j2249. Fletcher RH, Fletcher SW. 2005. Clinical epidemiology: The essentials. 4th ed. Philadelphia: Lippincott Williams & Wilkins. Jenkins KJ, Correa A, Feinstein JA, et al. 2007. Noninherited risk factors and congenital cardiovascular defects: current knowledge: a scientific statement from the American Heart Association Council on Cardiovascular Disease in the Young: endorsed by the American Academy of Pediatrics. Circulation 115:2995-3014. Lagoy CT, Joshi N, Cragan JD, et al. 2005. Medication use during pregnancy and lactation: an urgent call for public health action. J Womens Health (Larchmt) 14:104-109. Mitchell AA. 2003. Systematic identification of drugs that cause birth defects--a new opportunity. N Engl J Med 349:2556-2559. Mitchell AA. 2005. Studies of drug-induced birth defects. In: Strom BL, editor. Pharmacoepidemiology. 4th ed. New York: Wiley. p 501-514. Obican S, Scialli AR. Teratogenic exposures. Am J Med Genet 2011;157;150-69. Rasmussen SA, Olney RS, Holmes LB, et al. 2003. Guidelines for case classification for the National Birth Defects Prevention Study. Birth Defects Res A Clin Mol Teratol 67:193-201. Swan SH, Shaw GM, Schulman J. 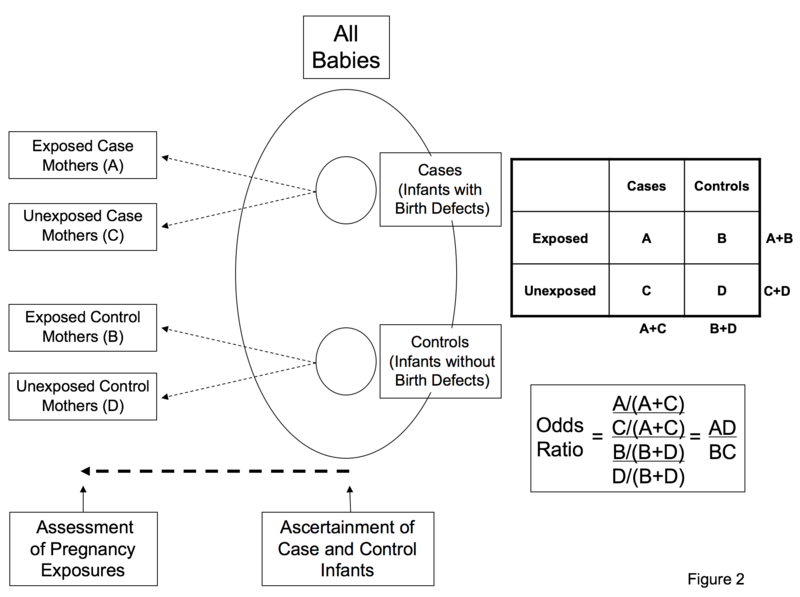 Reporting and selection bias in case-control studies of congenital malformations. Epidemiology 1992;3:356-63. Viera AJ. Odds ratios and risk ratios: what's the difference and why does it matter? South Med J. 2008;101:730-4.